Elizabeth Lambert was suspended from soccer earlier this month after video of her assaulting another player made national news. But in an interview with the Times, Lambert says it wouldn't have been such a big deal if she were male. Lambert is a member of the University of New Mexico's women's soccer team. The game in question was against Brigham Young University, as part of the Mountain West semifinals. 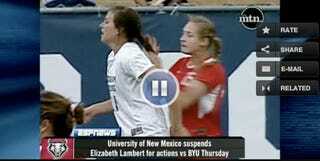 She has been placed on indefinite suspension for her actions, which include punching another player in the back, possibly throwing a punch at the back of an opponent's head, several instances of elbowing and tripping, and most notably, grabbing the ponytail of a BYU player and yanking her toward the ground. There is no doubt that Lambert's behavior was unsportswomanlike, and she admitted as much in a statement: "I let my emotions get the best of me in a heated situation. I take full responsibility for my actions and accept any punishment felt necessary." "I definitely feel because I am a female it did bring about a lot more attention than if a male were to do it," Lambert said. "It's more expected for men to go out there and be rough. The female, we're still looked at as, Oh, we kick the ball around and score a goal. But it's not. We train very hard to reach the highest level we can get to. The physical aspect has maybe increased over the years. I'm not saying it's for the bad or it's been too overly aggressive. It's a game. Sports are physical." Lambert has a point. Even the ESPN anchor introduces his segment by remarking: "What is rare is when women athletes are involved in any of this type of behavior." Indeed, Lambert's case is remarkable partially because we don't expect women to be as violent or as aggressive as men. Even more telling is the response Lambert has received from some of her new "fans." She says she has been taken aback by some of the attention, which focuses on how "hot" she comes across in the video, and reduces her very real acts of violence to "catfighting." "That appalled me," Lambert says. "A lot of people think I have a lot of sexual aggression. I was like, ‘Whoa, no, I don't feel that way at all.' That's bizarre and shocking to me."